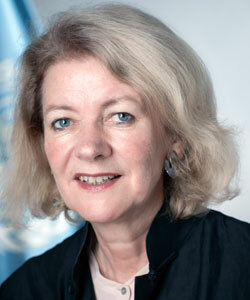 On 9 August 2017, United Nations Secretary-General António Guterres announced the appointment of Alison Smale of the United Kingdom as the next Under-Secretary-General for Global Communications, Department of Public Information. She succeeds Cristina Gallach of Spain, to whom the Secretary-General is grateful for her commitment and dedicated service to the Organization. The Secretary-General also wishes to extend his appreciation to Maher Nasser, who served as Acting Under-Secretary-General for Global Communications. Chief of Bureau at The New York Times in Berlin since 2013, Ms. Smale brings with her almost 40 years of international journalism experience in which she held some of the most prestigious positions in the profession. She has a proven track record as a reporter, editor and senior leader. Appointed Executive Editor of the International Herald Tribune (IHT) Paris in 2008, she is the first and only woman to have held that post. Ms. Smale joined the IHT in 2004 as Managing Editor from The New York Times, where she had been Deputy Foreign Editor since 2002, having joined in 1998 as Weekend Foreign Editor. Earlier in her career she reported for United Press International and The Associated Press as Bureau Chief for Central and Eastern Europe, Vienna (1986-1998) and Correspondent, Moscow and Bonn (1983-1986, 1978-1983). Having studied in Bristol, Munich and at Stanford University in the United States, Ms. Smale holds a Bachelor of Arts in German and politics, as well as a Master of Arts in journalism. In 2009, she was awarded an Honorary Doctorate in Law from Bristol University.